That wasn’t any act of God. That was an act of pure human fuckery. In a typical dystopian novel, it starts well after whatever catastrophe has affected humans and shows how they are dealing with the aftermath or learning the truth about what really happened. 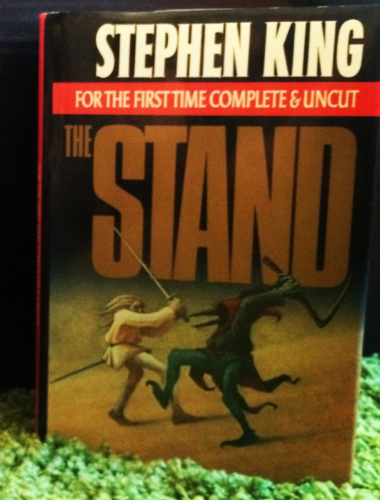 What I really liked about The Stand is King takes the reader step-by-step on how a superflu virus got out into the world where it goes from normal one day to eventually wiping out 99% of the population. It isn’t a quick ride, but it never felt like a slow one. Even though this was over 1,000 pages long, I loved every minute of it. King does a great job with writing distinctly different characters. Some you love, others can annoy you, but I found them all interesting and vital to the story. People find each other after the superflu kills off most people and they start to rebuild a civilization. There are two distinct camps though–one that is more democratic and the other that seems to get things done quicker because it’s run a more as a dictatorship that also has ulterior motives. It’s the classic tale of good versus evil, but even people on the so-called evil side are not purely evil. They have dimensions. There are also people on the good side that do not have pure hearts. The two sides are aware of one another and to come to a stand at some point, even though that isn’t the end of the story. The end was a bit anticlimactic, but I did not mind it so much. There is this big “fight,” so to speak, between the two sides, but that wasn’t the end of the overall story. There is a lot of traveling in this book so it also ends with some more traveling that gives some more depth to the characters. It was also interesting to get to know Randall Flagg, who I know will pop up in later King stories. I can’t wait to read more about him.